Wales is the third largest country comprising the United Kingdom. Located in the southwestern part of the main island, it is well-known for well-known for its distinctive history and language, which can often be found in exotically named villages. As with other countries in the UK, it represents a diverse patchwork of its own unique native culture combined with elements of the other UK countries. English is the common language. Wales is known for its extensive coastline that mixes scenery with landmark buildings and towns. Its interior is mostly mountainous. Conwy is a small walled town on the coast of northern Wales. 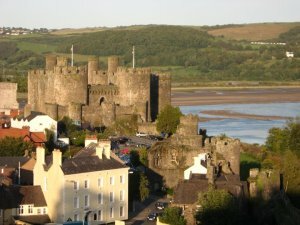 It is best known for the Conwy Castle and its town walls. The castle is one of four that form a UNESCO World Heritage Site epitomizing medieval military architecture. Hay-on-Wye is a small town located on the River Wye in southeastern Wales. Known as the "town of books", Hay-on-Wye has literally dozens of bookshops, especially second-hand, antiquarian, and collectors. It also has two Norman castles within a short distance of each other. Llangollen and Pontscysyllte are small towns located within a few miles of each other along the River Dee in northern Wales. Llangollen canal is popular for scenic boat tours. Nearby Pontcysyllte Aqueduct and Canal is a UNESCO World Heritage Site recognized for its innovations in civil engineering during the early Industrial Revolution. Pembrokeshire Coast, located in southwestern Wales, is both a national park and an extended trail that follows a coastline of rugged cliffs, sandy beaches, and unspoiled scenic beauty. Some of the beaches have good surfing, and there are various boat tour opportunities. The area also features important colonies of seabirds, as well as porpoises and seals. Snowdonia National Park is located in northwestern Wales. The park features Mount Snowdon, the highest mountain in Wales, as well as numerous castles, lakes, and waterfalls, and a historic steam railway. The region is popular for hiking, mountaineering, white-water kayaking, and other outdoor pursuits.